Simple, effective and very sensibly priced, Buffalo’s Nucleus Overboots and Overgloves help keep hands and feet warm and dry when the weather turns sour. 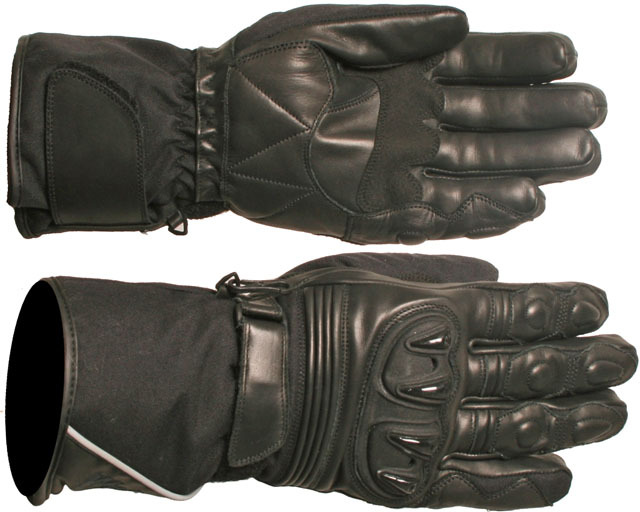 Easily stashed in luggage or under the seat, they can be pulled on quickly and easily to keep the rain and wind at bay – ideal for riders who prefer the feel and control of summer or mid-season riding boots and gloves, and as an extra defence against the cold and wet for exposed hands and feet. 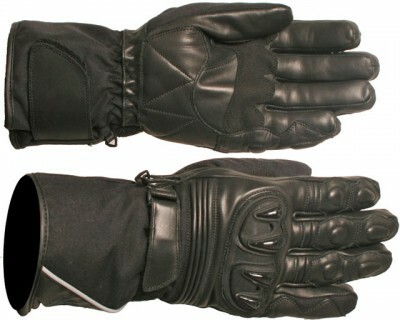 Overboots and gloves are also popular with scooter riders, who may not feel the need to wear heavy duty motorcycle gear, but still require protection from the elements. Both boots and gloves are made from water- and wind-proof PU-backed polyester, which keeps out the rain and acts a barrier against wind, too. The gloves feature a rubber section to the palm for grip, with an elasticated wrist and pull-cord cuff to help seal out the weather. The boots have a partially-treaded rubber sole, popper and Velcro® closure and an elasticated upper calf, plus reflective detailing for increased visibility. Buffalo Nucleus Overgloves come in sizes S/M – L/XL; the matching Overboots come in sizes S-XL. A tried and tested alternative to more expensive ‘high-tech’ winter riding kit, these motorcycling staples will help to keep riders warm and dry throughout the cold and rainy months without busting the budget. A new addition to the extensive range of gloves from Weise®, the Lima has the fit, feel and features of a top-of-the-range winter glove, but with an affordable price tag. Top of the must-have list for the year-round rider is to be warm, dry and comfortable, so the Lima features a waterproof, windproof and breathable inner liner and a 40-gram Thinsulate™ thermal layer too. Working together, they act a barrier against wind and rain, insulate from the cold and allow perspiration to escape. Genuine 3M Thinsulate™ is soft and compressible, making it flexible enough for gloves, which are difficult to insulate effectively without restricting movement or compromising fit. Stretch panels to top of hand and top of fingers are also a feature, enhancing fit and flexibility. Velcro® adjustment at the cuff and an elasticated wrist section ensure a snug fit under or over winter riding jackets, and help to prevent cold air and rain sneaking in through gaps. The full grain leather and textile combination construction is tough & durable, with integrated reinforcement at the knuckles, TPU shell armour and double-layered leather at key impact points. Reflective detailing for added visibility in low light tops off the Lima’s impressive spec. Weise Lima gloves come in sizes S-3XL. Multi-functional and with a fleecy section for extra comfort and warmth, the Gear Gremlin Bandana Fleece is ideal for plugging the gap between jacket and helmet when riding and keeping the wearer warm and comfortable off the bike too. Light and sheer, the Bandana’s top section fits easily beneath a helmet. It’s stretchy, so it sits close to the face and neck, and won’t bunch up or restrict circulation. It’s also seamless, for extra comfort, and breathable, to help prevent the build-up of moisture. The warm and cosy fleecy bottom section is also stretchy and is designed to be tucked comfortably into the collar of riding jackets. It helps to stop unwanted drafts getting in around the neck and prevents body warmth from escaping. 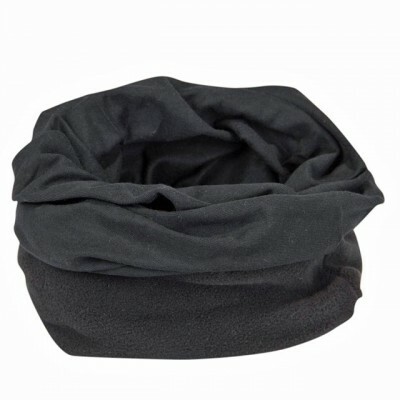 Off the bike, it can be worn in many different configurations: a balaclava, face mask, neck scarf or beanie, and is equally useful for many other outdoor activities. One size fits all. 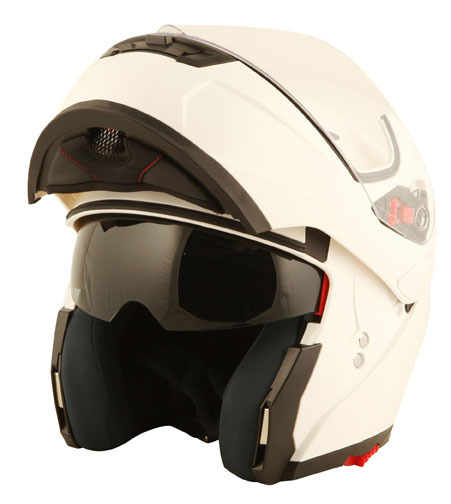 Feature-packed and with a no-frills price tag, Duchinni’s new D606 Flip Front Helmet is a great choice for budget-con scious commuters and tourers alike. Its single button visor and chin bar release makes light work of any face-to-face situations, such as fuel stops, asking for directions or grabbing a swift snack or drink on the go. The quick-release, seat-belt style chin buckle means there’s no fiddling about in the car park or bike bay; just un-clip and go. The strap is fully adjustable, for a snug and secure fit. In addition to an anti-scratch visor there is an internal flip-down sun visor. Vents to top and chin bar work with a rear exhaust vent to channel air through the EPS liner and keep the head cool when the journey heats up. The high quality textile lining is also fully removable and washable, to keep it fresh and bacteria/odour free. For riders planning longer journeys on major routes, the D606’s aerodynamically designed shell offers cleaner airflow to keep the head stable and ease fatigue at higher speeds. The tough ABS outer shell features UV protection and is fully certified to the current ECE22.05 safety standard. The Duchinni D606 Flip Front comes in sizes XS-XL in plain White or Black. New from the Gear Gremlin range of motorcycle tools and accessories, the CO2 Canister Valve Adaptor makes light work of emergency tyre inflation. Compact and light, the Adaptor can be left under the seat or stowed in luggage and forgotten about until required. When it’s time for a top-up, just screw a Gear Gremlin CO2 canister into the bottom of the Adaptor and push onto the valve to release the gas and inflate the tyre. The Adaptor suits the Schrader valves found on most motorcycle and scooter tyres. Much quicker and easier to operate than a hand/foot pump, and more compact too, the Gear Gremlin Valve Adaptor is ideal in situations where a tyre needs inflating quickly and easily, e.g. dealing with a slow puncture or a repaired tyre at the roadside. A useful addition to any rider’s emergency tool kit, Gear Gremlin’s CO2 Adaptor comes in black or green. Compatible CO2 canisters come in packs of three. New from Weise®, Marin Trousers are adaptable to both the rider and the elements, thanks to their braces and quilted liner, both of which are removable. Designed to cope with unpredictable weather, Marin trousers are made from a 600 denier textile, with a waterproof, windproof and breathable drop liner. In cold conditions, a thermal quilted liner keeps the legs insulated, while the raised back section at the waist helps stop draughts sneaking in between trousers and jacket. When the temperature rises, the quilted liner can be removed and zipped vents on the thighs can be opened, allowing cool air to circulate. Removable and adjustable braces help to stop the trousers from slipping down, preventing wind and rain from seeping in around the waist, while an adjustable Velcro® retained twin belt system ensures a snug and secure fit. Impact protection is provided by CE-approved armour at the knees. To aid flexibility and movement, there are stretch panels above and behind the knee as well as the inner leg and there are two concealed external waist pockets with zipper closure so that daily essentials are easy to carry. Weise® Marin Trousers are available in sizes S-5XL. Stylish, comfortable and with Draggin’s proven protection built in, the new Roo Hoody is designed for the days when a full-blown riding jacket feels a little too much. Cut to look and wear like a high-street hoody on the outside, the Roo is lined with Roomoto™ – Draggin’s own abrasion-resistant fabric – in key areas on the inside, for peace of mind. Constructed using DuPont™ Kevlar®, Roomoto™ is proven to be highly abrasion resistant, yet is soft, breathable, flexible and non-allergenic, for day-long comfort. Draggin is the World’s first preferred licensee for motorcycle garments constructed with DuPont™ Kevlar® fibre, so the wearer is guaranteed to be getting genuine Kevlar® protection. In addition, the Roo Hoody also features Draggin’s Dffuse CE-approved armour at the elbow, shoulder and back, to help guard against impact. All can be removed, so the Hoody can be washed. The Roo Hoody includes a zip closure with an easy-to-use puller, an adjustable and removable hood, and thumb holes in the cuffs, for easy and neat fitting under gloves. There’s also a toggle-adjustable waistband to ensure a snug fit, convenient hand pockets and an inside pocket for valuables. 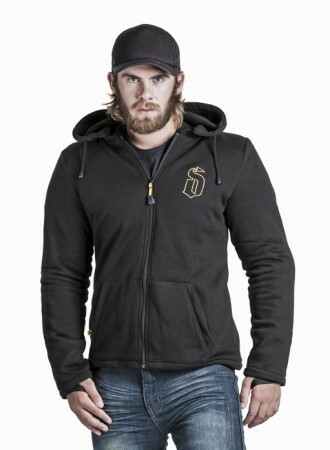 The Draggin Roo Hoody is available in sizes S–3XL. Draggin is exclusively distributed in the UK by The Key Collection. Find your local stockist here. Buffalo’s tough new Sonar textile combination is built to take whatever the journey throws at it. 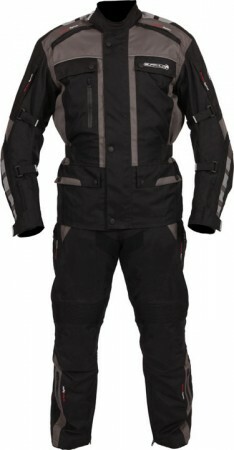 Both the jacket and trousers feature a tough 600-Denier outer shell, which is resistant to abrasion, tears and holes. 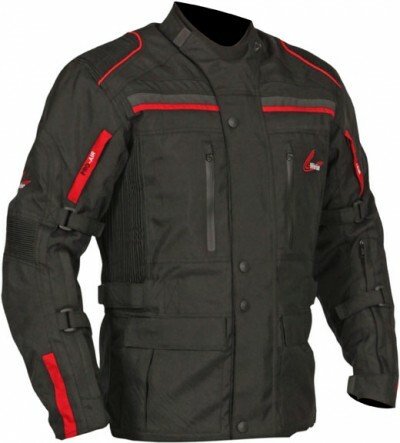 There’s CE-approved armour at the knees of the trousers and at the jacket’s shoulders and elbows, with a pocket provided for a back protector (available separately). Combating the elements is a waterproof, windproof and breathable drop liner, with a removable quilted thermal liner included in both the jacket and jeans. When the weather gets warmer, zipped vents at the shoulders, arms and back of the jacket and on the thighs of the trousers enable cool air to flow through. Adjustable Velcro® retaining straps at the cuffs, collar and the waist of the jacket and trousers allow for the addition of extra layers, sealing out the wind and weather and ensuring a snug and comfy fit. Straps on the upper and lower arms help to stop the jacket flapping around when riding. The trousers have removable and adjustable braces with a rear support panel and raised back to the waist for additional weather protection, which can be connected to the jacket via an 8-inch zip. The wearer has a total of 11 pockets to choose from – the jacket has four external pockets with zipper and popper closure, one external pocket with waterproof zipper, three internal pockets and a map pocket; the trousers have two concealed external waist pockets with zipper closure. Feature-packed and sensibly priced, the Buffalo Sonar textile two-piece touring suit offers great value for the budget-conscious traveller. The Jacket is available in sizes S-5XL, in Black/Gun; the matching trousers come in S-5XL. New from Draggin, BLKGEN jeans combine the reassurance of DuPont™ Kevlar® protection with the appearance of high street fashion.Draggin pioneered Kevlar-lined biker jeans in 1997 and their latest BLKGEN design is the result of that extensive experience. 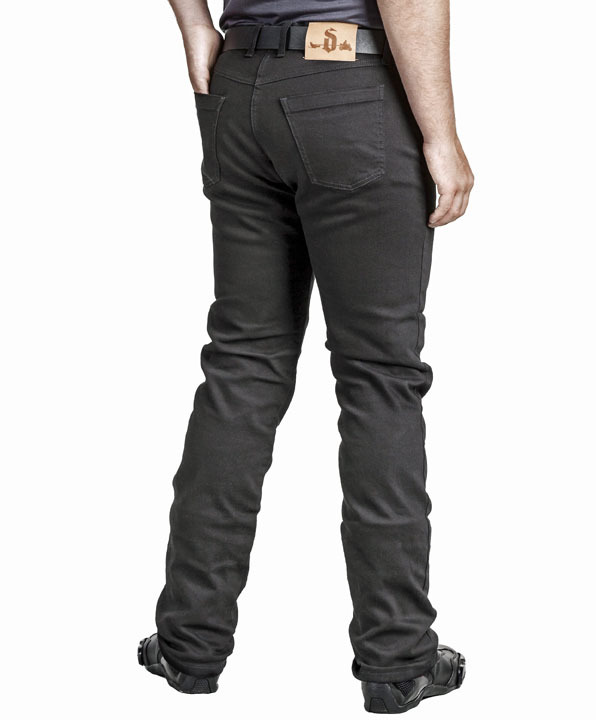 Made from stretch denim, with a straight leg and mid-rise waistband, they will fit most riders. They also look great, because there are no visible panels and no external seams. Comfort is assured, thanks to a sports liner that draws away moisture in summer and keeps the wearer warm in winter. They are lined with Draggin’s very own abrasion-resistant fabric called Roomoto™, which offers unrivalled safety plus climate control. Heat and sweat are drawn away from the skin, keeping the rider cool, while an antibacterial treatment keeps them fresh. Draggin is the World’s first preferred licensee for motorcycle garments built with DuPont™ Kevlar® fibre. This partnership created Roomoto™ – a soft, breathable, flexible and non-allergenic lining – for abrasion resistance and day-long comfort. Draggin Jeans’ patented positioning system ensures that each and every of the contact points are well covered with Roomoto™ – specifically designed and positioned to keep skin safe at all legal speed limits – and secured with heavy duty stitching. Draggin’s CE Approved armour is also available and can easily be fitted to the knees and hips for additional impact protection, if required. Draggin BLKGEN jeans come in sizes 28”-44” waist and are exclusively distributed in the UK by The Key Collection. 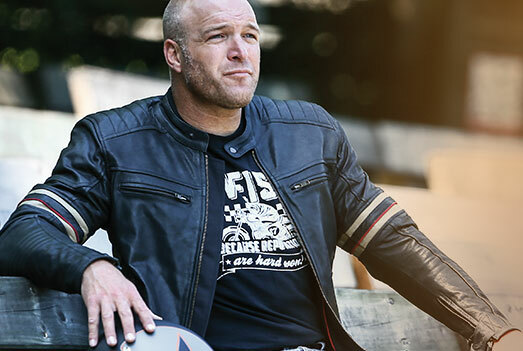 Weise® has added two feature-packed jackets to its 2015 range. Built to deal with the unpredictable weather encountered by touring riders and commuters alike, the Atlanta has a popper and Velcro® retained storm flap over its YKK® main zip, a waterproof, windproof and breathable drop lining and a removable thermal quilted liner too. 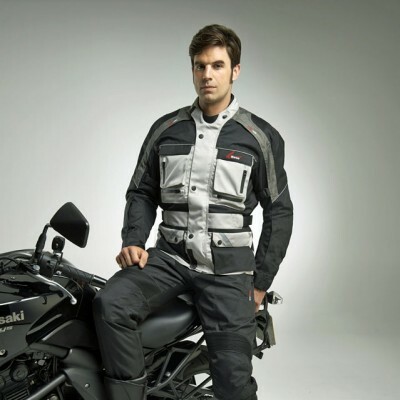 If things take a turn for the better, there are waterproof-zipped vents at the chest, sides, back and arms, and the collar features a loop and hook system so the wearer can secure it open while riding, or when wearing the Atlanta off the bike. Velcro® adjusters on the arms, cuffs and at the waist allow for the use of base layers, while stretch panels at the shoulders, sides and elbows aid comfort and mobility. The Atlanta provides plenty of carrying capacity, with two external and three internal pockets, a waterproof ‘Napoleon’ pocket behind the main zip – ideal for wallet or mobile phone – and a rear pocket with side entry. CE-approved armour is fitted at the shoulders, elbows and back as standard. The Weise® Atlanta comes in sizes S-5XL, in Black and Black/Stone, priced at £159.99 including VAT. Selling for just £129.99 including VAT, the Zurich is the entry-level jacket in the Weise range, but doesn’t compromise in quality of materials or specification. It has a waterproof, windproof and breathable drop liner, removable thermal liner and popper and Velcro® retained storm flap over its YKK® main zip. Fully vented for the warmer days, like the Atlanta, the Zurich’s collar can be held open with the loop and hook system. Velcro® adjusters feature at the waist, arms and cuffs, and there are stretch panels at the shoulders and protection is provided by removable CE-approved armour at shoulders, elbows and back. The Zurich boasts six external pockets, including two small ones with waterproof zips, and four internal pockets too. Plus a waterproof ‘Napoleon’ pocket and large rear pocket. It’s available in sizes S-5XL, in Black and Black/Stone.